Today’s message is on Matthew 5:21-26. Pastor Jeremy Peugh preached on anger. a response to a thwarted will. contempt that leaks out of us. Make reconciling broken relationships a higher priority than being religious. Initiate genuine kindness to your enemy. Be intentional about feeding your mind. Reflecting the Cross is what we are supposed to do. Is the main cause of anger others,self, or something else? In anger God’s will is not being done. The passage for today’s message is Matthew 5:17-20. Beware of glittering vices: qualities that look like virtues, but they make us proud, arrogant, and unloving, so they end up destroying our souls. Christianity is not about following the rules or breaking them; it is about following Jesus. Know the book. Do the book, but do not stop there. Step into the Kingdom. In today’s message Pastor Jeremy Peugh preached on overcoming evil, using Matt 5:13-16 as a guide. To indulge evil, to oppose evil, is to oppose God’s Kingdom. Suffering happens to you; evil happens in you. When I do something wrong I attribute it to having difficult circumstances. When others do something wrong, I attribute it to bad character. A kingdom will typically work to improve or increase its sphere of influence. Whose kingdom are we advancing? Whose job is it to oppose evil? This is the job of the church, His church. Where are you needed? Whom should you be talking to? Who needs to hear the Gospel? The passage for this message is Matthew 4:23-5:12. Here is the bulletin. The church is not a museum for saints; it is a hospital for sinners. 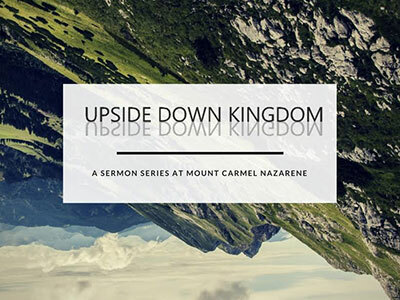 Jesus in the Sermon on the Mount strongly contrasts the world’s view of the good life. To be in the Kingdom means to be blessed no matter what happens. The first rule of God’s Kingdom is this; no pretending.